Is your system security up to date? 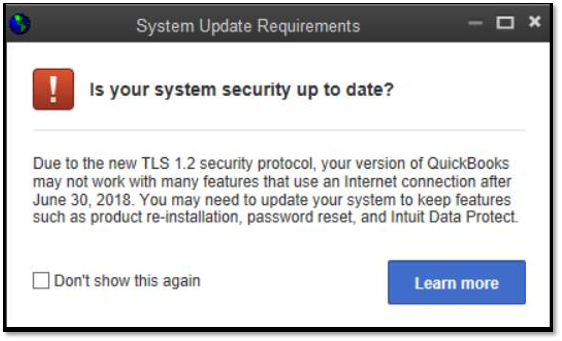 Due to the new TLS 1.2 security protocol, your version of QuickBooks may not work with many features that use an Internet connection after June 30, 2018. You may need to update your system to keep features such as product re-installation, password reset, and Intuit Data Protect. If the listed services/items are not needed or important to you, you can continue using your current QuickBooks version. If you are using QuickBooks 2012 to 2014 and you only need access to QuickBooks Desktop activation on a new computer and the Password reset tool, make sure you meet the following system requirements and then run the TLS 1.2 Readiness tool. The tool updates your system to become TLS 1.2 compliant provided it meets all Windows Operating System, Internet Explorer and .Net requirements listed below. If you need all the listed services/items or if you are using 2011 and earlier and need any of the listed items, you will need to upgrade to the latest QuickBooks version and meet all these system requirements. (UK only) If you need access to VAT e-file you will need to upgrade to the to the latest QuickBooks version and meet all these system requirements. For more information, see QuickBooks Desktop VAT e-filing & Making Tax Digital (UK). Internet Explorer Please make sure that you are using Internet Explorer 11 for the best security, and continuing updates by Microsoft. .Net Framework The .Net version will need to be 4.5.2 or greater. Please update to a later version of .Net as needed. Download .NET Framework from Microsoft's website. Internet Explorer Group Policy If prompted by an error message, you may need to talk to your IT person/department to allow TLS 1.2 protocol in Internet Explorer. See this Microsoft article for more information on how to default to TLS1.2 when group policies show that you have correct Internet Explorer, but do not have TLS 1.2 enabled.